This is the story of how two English Teachers’ Clubs (ETCs) in Bhandara and Wardha in Maharashtra made a huge difference to teachers’ lives and promoted their professional development. The Bhandara ETC, born around 2002, emerged out of a few teachers’ attempts to tackle immediate challenges. A group of teachers working in villages around Bhandara were struggling to cope with the radical syllabus reform introduced by the Maharashtra State Board of Education, and to find ways to handle a completely alien-looking textbook. Another group of young post-graduates was struggling to find ways to tackle the tough National Eligibility Test (NET). Through a series of Sunday meetings with a senior teacher who had just returned from the UK, they managed to sort out some of their problems. But the groups continued to meet and evolved into an ETC on the lines of self-help groups in micro-finance. Later, through a project, partly funded by the Hornby Trust and the British Council, attempts were made to launch ETCs in other places of Maharashtra and some other states. The other successful ETC at Wardha was launched during this project. So, the ETCs were born out of teachers’ needs and their initiative. 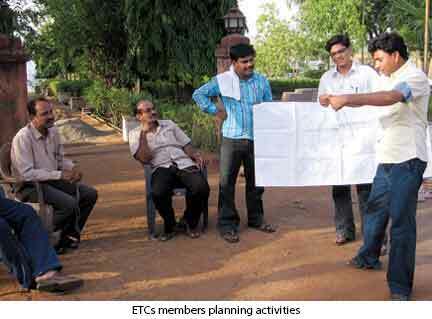 Each ETC is a group of 10-15 members from the town and its immediate neighbourhood. Basically, they are small and informal self-help groups where members share the ownership and responsibilities collectively. The word ‘club’ was a deliberate choice to emphasize the informal, flexible, non-hierarchical and collaborative nature of the group. There are no office-bearers and no formally structured norms of duty, responsibility, and accountability, though there is an explicit understanding about these. The ETCs are marked by collective decision-making, sharing of responsibilities and expenses, and activities chosen, planned and implemented by the members. Members meet roughly once a month. One typical activity of the ETCs is to talk. Members talk of their classroom life, personal life, aspiration, worries, ideas, experiments, and so on. Tony Wright, a well-known teacher trainer and educational researcher, says that ‘talk is the fuel of teacher development’ (Wright, 2000:4). Other activities include practicing speaking in English, organizing small workshops and talks for themselves and other teachers, planning and carrying out small classroom experiments, collectively studying research articles and books, attending conferences and seminars, and undertaking small scale projects like the ‘Reading Labs’ project. Increase in confidence and awareness: The ETC members have gained a greater awareness of various principles and practices in ELT. They are more willing and confident to try out new things in their classrooms, and believe that improvement in both teaching and learning is possible. Development in teaching skills: Their teaching skills have improved remarkably through interactions with other members, collective study sessions, exposure to larger networks like IATEFL and events like conferences, and first-hand experience of good ELT practices. Improvement in spoken English and communication skills: Most ETC members were concerned about their spoken English and joined the ETCs hoping to improve. The ETCs provided opportunities and a safe atmosphere for members to practice their spoken English and communicate in English in real-life situations. Some members have now improved to the extent of their making presentations at conferences. Change in attitude: One remarkable change has been in the members’ attitudes to teaching and learning English and to learners and their contexts. A comparison of ETC members and non-members (Padwad & Dixit: 2008) showed that ETC members were more open-minded, considerate and tolerant of diversity, more positive towards constraints and problems, and more concrete and specific in thinking about their work. Less frustration and more job satisfaction: Teachers rarely find any scope for sharing their teaching experiences and concerns or for professional interaction, and lack a place to seek help and support. This leads to a general mood of frustration about their work, from which ETC members too suffered before joining ETCs. They found this scope and a strong emotional support in the ETCs through group trust and openness, and now don’t feel lonely or helpless. To conclude, the ETCs are a very powerful example of how continuing professional development (CPD) of teachers can be effectively promoted. In the ETCs, members find scope, opportunities, and support for CPD and a safe space for experimentation and reflection. They strongly contrast with the ‘official’ teacher development programmes – primarily isolated, irrelevant and ill-planned training events – which do not address teachers’ needs or interests, do not trigger a long-term process of development, yet which teachers are compelled to attend. The ETCs are also a living example of what teachers can achieve when they take their CPD in their own hands. Padwad A & K K Dixit (2008) ‘Impact of professional learning community participation on teachers’ thinking about classroom problems.’ TESL E-Journal, 12/3. Available online at http://tesl-ej.org/ej47/a10.html. Wright, T. (2000) ‘Teacher development: A personal view.’ CAVES English Teaching, 24, 38-43. Amol Padwad is Head, Department of English, J M Patel College, Bhandara and former National President, English Language Teachers’ Association of India (ELTAI). Krishna Dixit is Head, Department of English, Yeshwant Mahavidyalaya, Seloo, Wardha and a freelance ELT trainer and consultant.